Not only do Christal and Kathy play healthcare professionals on this website, they also do so in real life. Becky Peterson, the medical assistant who works with Lin, sits down with patients first and asks them about their symptoms and medical history—questions Lin used to ask. When Lin comes in the room, she stays to take notes and cue up orders for tests and services such as physical therapy. When he leaves, she makes sure the patient understands his instructions. The division of labor lets Lin stay focused on listening to patients and solving problems. “Now I’m just left with the assessment and the plan—the medical decisions—which is really my job,” Lin says in a quiet moment after seeing a patient at the Denver clinic where he works. We’ve been trying lots of things in our clinics at UCHealth because there is a national crisis of physician burnout, a national imperative to improve patient satisfaction, a national push towards electronification of healthcare, and a national imperative to improve quality. We are of course, continuing our work on EHR 2.0 Sprints: see past posts Epic Sprint! Or, how we learned to love the EHR (part 1), Patients come second (so that everyone does better)! Addressing Physician Burnout, EHR Sprint team: work hard, persevere, sometimes you get to build a dream team, and stay tuned for future posts to come. Added Medical Assistants to a primary care clinic to invert the usual ratio of 1 MA to 2.5 MD’s, to 2 MA’s per 1 MD. The MA then completes post-visit tasks, vaccinations, education, after-visit summary printing, reminders, phlebotomy, followup appointments. Quality metrics improve (non-physicians pay more attention to consistent screening for vaccines, colonoscopy, PAP smears, foot exams, prescription renewals, standard monitoring for chronic illness). I have to acknowledge the hard work of our Family Medicine colleagues at AF Williams Stapleton Family Medicine and the Snow Mesa Poudre Valley Internists clinics in the University of Colorado “UCHealth” system, who pioneered this work, based off of the Care by Design model from Utah. Thank you to those who blazed a trail. CMIO’s Take? What’s not to like? Despite “who moved my cheese” change-management issues, we’re finding that we run out of qualified MA candidates, we are hiring so many. Is this the doctor of the future? Team-based Healthcare of the future? Was healthcare supposed to be a team-sport from the beginning? It is one vision, and a darned good one so far. Picked up this book because my online community of friends raved about it. I like trying new genres, stretching to see if my mind can appreciate new ideas, new styles. I listened to this on audible.com (highly recommended, btw: all those morning commute blues evaporate in the listening). In reading books about how our minds work and how to build resilience, it seems that letting our minds wander results in predominantly negative thoughts, unlike a mind focused on a challenging task. The blurb about the book was promising: fiction, told from many first person perspectives, about President Lincoln, grieving for his young son, who perished from pneumonia. The twist is that on the Audible version, over 30 narrators supply the many voices, some from accurate historical accounts, some from souls stuck in purgatorial-never-land, as they observe the President’s grief and glimpse his thoughts. The first clue as to how much like liked the book was in how I gradually accelerated the playback, first at 1.0x speed, for books I enjoy, to 1.25 and eventually landing on 1.5, hoping to be done sooner. I tried. The unmistakable voice and cadence of David Sedaris pops up, and is entertaining, but is insufficient to hold my interest. It IS an interesting perspective on an inflection point in our country’s history, told in a very personal (and somewhat zombified way?!). Lots of folks liked it, it just wasn’t for me. CMIO’s take? The literary technique, when a purgatorial ghost can temporarily inhabit the body of a living person and hence hear his/her thoughts is a delightful and clever illustration of empathy. And empathy is how all informatics gets done. This is interesting. Nice to be recognized by Becker’s. Seems like the “CMIO’s to know” list grows each year. And, as long as I’m on the list, I’d say this is an AMAZING, THOUGHTFUL list. If I were NOT on the list, I would of course call this a nonsense popularity contest. CMIO’s take? A CMIO’s work is never done. We will soon be in a post-fee-for-service world. In this new world, it will be necessary to re-invent healthcare teams AND optimize the EHR AND stay ahead of the uncertainty and tumult to come. The end of Summer, and of the line up of Food Trucks throughout the every-Wednesday summer extravagance. Until the brief fall and onset of winter, that means flowers, blue skies, a chance to get out of our own heads, our stuffy offices, our walled-off Ivory Tower, and look around. For example, how many of my colleagues know the history of that building in the background? The poetically-named “Building 500” was originally the Army Recuperation Hospital, built in 1927 for veterans from the first World War. 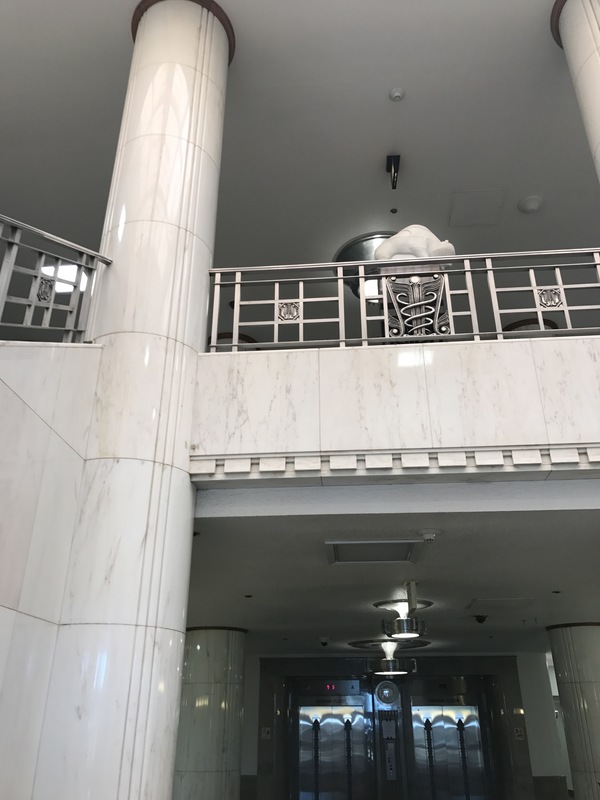 Its entryway is comprised of amazing, art-deco white marble, mined from Marble, Colorado, the same marble that was used to build the Lincoln Memorial. 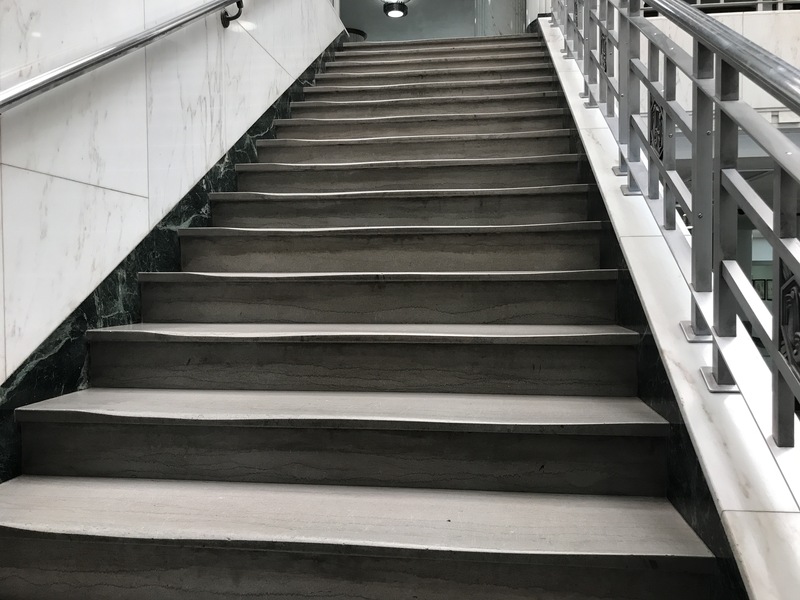 If you look carefully at the steps going up from Ground to First Floor, you can see where decades of soldier’s boots wore a rut into both the upgoing and downgoing marble stairs. Building 500 is also the site of a tiny by-appointment-only museum of President Eisenhower’s hospital room. Eisenhower suffered a heart attack while playing golf on the Fitzsimons Army base, initially treated as indigestion by his Presidential physician. Subsequently recognized as a heart attack, he was promptly put to bedrest, and treated with oxygen and morphine, the state-of-the-art care in 1955. Eventually the White House Cabinet members traveled by train to Colorado, and buildings at Fitzsimons Army Base and the Lowry Air Force base became the “Western White House” for a month during Eisenhower’s recuperation. The University’s chapter on this campus began in 1999, with the agreement that the Feds would “sell” this square mile to the University for the price of $1, transitioning this land to a non-profit organization essentially for free. As one of my colleagues so aptly said: “Free is great, if you can afford it.” Think about it. Since then, the entirety of University of Colorado Hospital and its 60 clinics have arrived, as has Children’s Hospital of Colorado, and soon the Veteran’s Affairs Hospital for Colorado. The Anschutz Medical Campus contains these three organizations, as well as 5 healthcare schools in the education quadrangle including the University of Colorado “CU” School of Medicine. It also contains all the CU research labs in the Research Quadrangle. This land has since attracted the Well Simulation Center, a housing quadrangle, and a Bioscience Research Park, hosting innovative companies developing partnerships with the scientists on this campus. It is a great place to work. CMIO’s take? There’s a lot to be said about institutional memory, our roots, and how we got to where we are. I enjoyed being part of the panel discussion and hearing different perspectives on how health care organizations are tackling “optimization” “efficiency” “patient-centeredness” “vendor accountability” “customization” “team-based care” and “practice redesign” to improve satisfaction and reduce physician burnout. CMIO’s take? Lets learn from each other. There are more smart people who DON’T work for you, than who do. Summarize your last meeting, or discussion, or class, or event that you want to remember, in 30 seconds. Maybe even an entire book. The act of having to prioritize, to summarize, to choose what is important, to actively recall — this engages the frontal cortex just enough to help re-inforce memories. It is indeed a “mind-sprint” equivalent of an 100-yard dash. This is not only backed by science (see that Coursera course!) but feels right. I currently use a little black book to write down minutes of my meetings. However, I DID NOT take the extra 30 seconds to summarize. I think I will begin doing this. CMIO’s take? Just like one should never be “too sick to go to the doctor,” one is never too old to learn something new. Thirty seconds is all it takes. Do you do this? Let me know!